Introducing the GoCrib. A lightweight, rugged, inflatable crib that fits in a backpack. As soon as I saw the video I wanted to buy this crib though my husband Scott was skeptical that an inflatable could be as sturdy as this one claimed to be. But it has indeed proven to be a must have travel product. 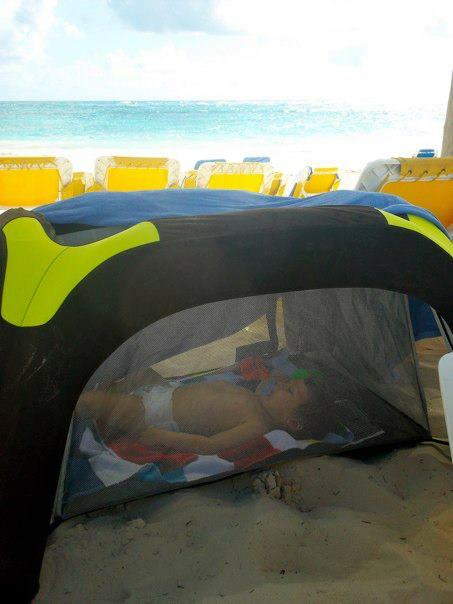 Whether you are staying in a hotel for a night, going on an international beach vacation, hanging at a neighbor's pool party, watching a soccer game, or need extra sleep space during a playdate, the GoCrib is an easy solution. Watch this video to see it in action. Last March we brought the GoCrib on our trip to Punta Cana, Dominican Republic while staying at the all-inclusive Ocean Blue and Sand Resort. As you can see, instead of having to take Morgan to our room for a nap, we were all able to relax on the beach instead. I have been wanting to write a blog post on the GoCrib because we have been extremely happy with it, but after a year and a half of use our crib had developed a small leak. I could not in good conscience recommend this product until I found out how the company resolved product malfunctions. I must say that the Guava Family's customer service is phenomenal. I emailed the company and on the same day I received a personal response from the creator of the crib, Scott Crumrine, asking me to give him a call in the morning. I explained the leak to Scott and appreciated his honesty that although it rarely happens they have received a few reports (out of thousands sold each year) that a crib had a leak. Scott's solution to the problem was to ship us a new GoCrib and I could mail ours back in the new box with the return shipping included so his team could try to figure out where the leak was coming from. Customer service can't get any better than that. Forget the traditional pack and play, GNG highly recommends the lighter, more compact, and sleek looking GoCrib.